Canopy beds are awesome ways to turn a boring bedroom into a luxurious, sumptuous retreat where you can truly feel like a royal at the end of the day. You can transform your bedroom into a romantic place easily with the addition of a simple canopy. This easy DIY canopy will make you feel like you are in fairyland and will look good with any style. All you have to do is drape some sheer, gauzy material on top of your bed posts then string these gorgeous fairy lights for a dreamy bed. It doesn’t have to be a full canopy to transform your bedroom into something dreamy, you can make like this bedroom and install a tall, gauzy canopy for the effect as well. The sheer fabric behind the headboard also makes it look like a feature wall. This stylish bedroom marries both feminine and masculine styles harmoniously, where the geometric elements make the room look more interesting. The other soft furnishings are frilly and feminine. This romantic and elegant bedroom is decked out with couples in mind so that you can feel like you are staying in a villa everyday. The intricately patterned canopy on the bed’s four posts is adjustable and can be taken off if you fancy. This whimsical and dreamy room looks grand and dramatic at the same time. 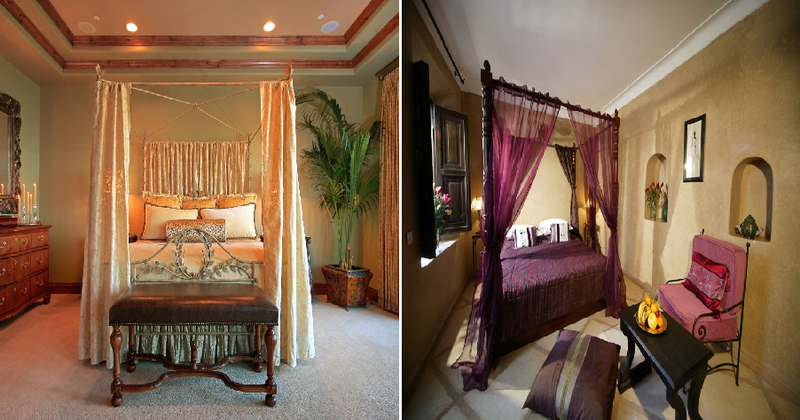 The ornate gold bed boasts an open canopy with shimmering golden fabric which complements the soft sage green walls. This serene blue bedroom is already sophisticated enough without the plain canopy attached to the bed but with its addition, it gives it a classier feel. If you don’t want the canopy to be open all the time, tying it back stylishly also works. Add some character to a boring bedroom with the addition of a crown canopy that opens up at the headboard of the bed. The drama factor in this bedroom is amped up by the matching fabric patterns of the bedding and the drapery. In this all white bedroom, things are kept from being too bland with the addition of a quirky canopy draped in a shape of a tent. The flowing fabric will ensure your bedroom is always magical. Create the bedroom that you have always wanted as a little girl with the addition of a simple crown canopy on the ceiling. Drape a lacey, shimmery canopy to complement the rich bedding and you have the perfect princess bedroom. This exotic wooden bed with the ornate posts are perfectly matched with some see-through tulle fabric in a dark purple colour. This colour scheme is continued throughout the rest of the room’s furnishings, which looks gorgeous with the dark coloured wood elements and offset by the light walls and floors. Famed Architect, Winston Shows Us 6 Easy Steps to Create an Artistic Wall By Using Paint!